Home / colour tattoo / makeup / maybelline / spring makeup / "The beauty of a woman must be seen from in her eyes, because that is the doorway to her heart, the place where love resides." 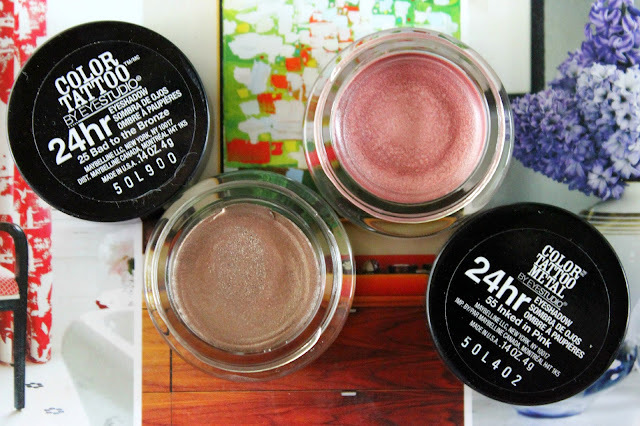 While I've started to embrace more drugstore makeup lately, one category that I find consistently falls short is eyeshadows (and highlighters, but that's a rant for another day). 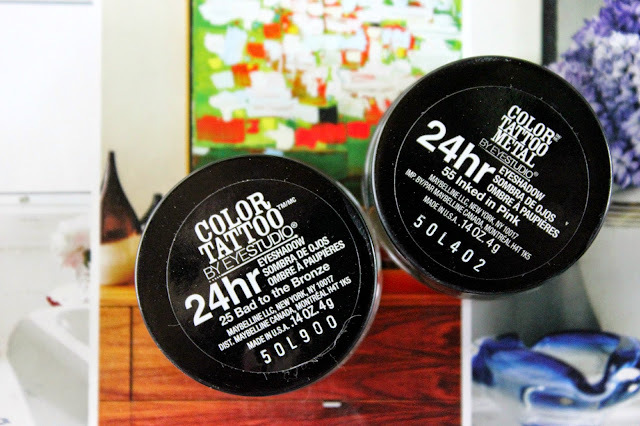 I'd heard a lot of beauty girls rave about the Maybelline Colour Tattoo's before, but I'd never found them on sale (drugstore products almost always go on sale, so I waited it out). I finally came across these at half price the other day, so I picked up two colours: "Bad to the Bronze", and "Inked in Pink". I have to say it: I get what all the hype is about. These shadows are absolutely amazing! You can quickly slap them on your lid with your fingers when you are in a rush, or more meticulously use a brush, and blend them in seamlessly. I always use the Too Faced Eyeshadow Insurance, even under these, but the combo is perfect, and does not budge at all. For both colours, you can apply them very sheerly, adding just a hint of colour, or really build them up for a more intense look. "Bad to the Bronze" is more of a browny shade than a true bronze, but in certain lights, you can definitely pick up that more muted, golden sheen. With a hint of shimmer, it's the perfect colour to wear from day to night. I love adding some of the matter colours from by Becca Ombre Nudes palette into the crease for a bit more definition. "Inked in Pink" is a difficult colour to explain. It's a very metallically looking deep pink, that had a touch of gold in it as well. I've also just picked up "Black Orchid", but it was listed as limited edition, and was the only one left, so I didn't want to be too much of a tease and include in. But if you can find it, it's an absolutely gorgeous purpley-taupey-grey colour, that I can see myself wearing every day this fall. Have you tried out the colour tattoo's yet? What are your thoughts?